I charge $95/hour for a consultation which usually lasts an hour or so. If you are out of my area (Santa Cruz Co.) there is a reasonable fee for travel time. If your project requires a full design I will gather information from you at the consultation regarding your goals and desires. I will measure your property and create an up-to-date scale site map indicating property dimensions and any permanent structures (house, deck, walkways, pool, trees, etc. )that are to remain and any other pertinent information. This will be used for your final design. Sometimes it is helpful to have a preliminary design concept drawn so that you can envision how the new space will look and flow with the family's needs and traffic patterns. I can convey my design intent in a preliminary drawing so that you can decide which concept most suits your needs. I will include this in your bid also. You will be provided with several copies of your design drawn to scale, one of which will be color rendered to help you further visualize the design intent. 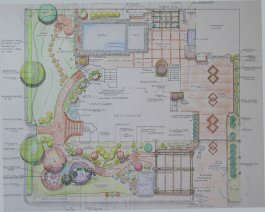 There may be a separate hardscape plan in addition to the planting plan depending on need. A plant list indicating species, number and suggested size of will also be provided. It customarily takes between 4 and 6 wks from the initial consultation to complete a project. 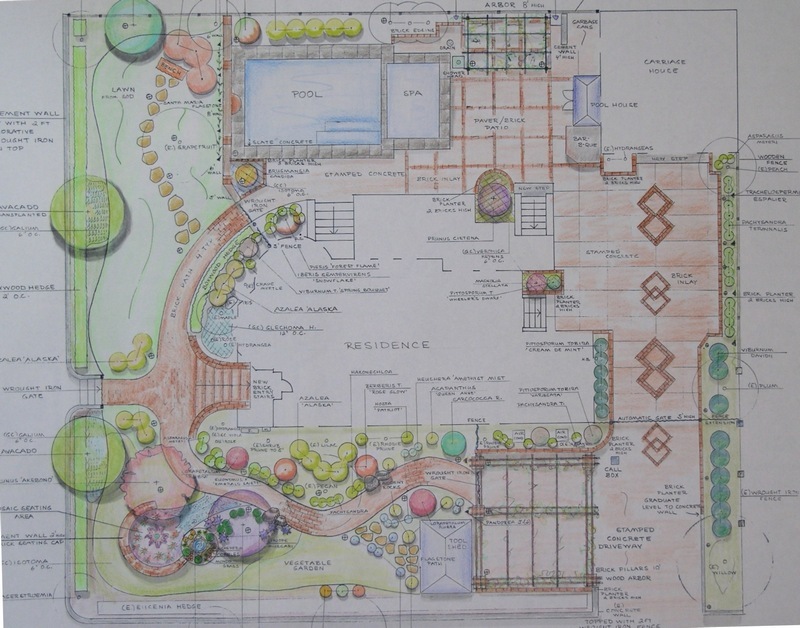 The cost of a landscape design varies with the size and complexity of the project. This can vary from approximately $900 and up . However, I do many "pocket designs" for less. It all depends on how I can convey the information to you in the quickest but still accurate manner. I can also provide the names of licensed landscapers that will bid your entire project or install specific aspects such as patios, decks or retaining walls. If additional meetings are desired for more in-depth plant discussions or for contractor consultations during the installation phase, this will be billed at consultation rate of $75/hour. "Just a note to thank you for the wonderful plans you drew for my mountain-top garden. Thek are just what I wanted and I think they will translate well to the finished yard. I'll be anxious for you to see it when the vavious stages are completed. Thanks again,"
"Jan, it's been wonderful to work with you on our garden. Your design made it the outdoor living space we have always hoped to have. We spend every evening after work enjoying it and will have you start on the pool design soon. Thank-you."